Like others before it, the early morning began with coffee. I sipped it slowly as we loaded the car. We had a large plastic model town called an Enviroscape, a groundwater flow model, and equipment to help 30 6th grades at Victor School build their own aquifer. Kitty, the Program director, and Hillary, WEN's summer VISTA and I hopped in the car and headed south into the Bitteroot Valley. We arrive in the small town of Victor with early, but circled a few blocks before we finally stopped at a gas station to ask for directions to the school. We pulled up and signed in, admiring the class photos dating back to 1927 on the walls. When we entered the classroom the happy teacher greeted us and we started setting up. 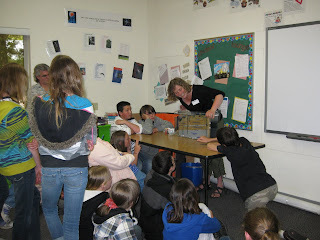 The build your own aquifer activity was engaging. Students first tested how much water moved through one of the 4 substrates they had samples of : sand, gravel, dirt and clay. Then they took three of those substrates and made their own aquifer. We then cleaned up the aquifer and set-up two stations: the groundwater flow model and Enviroscape. 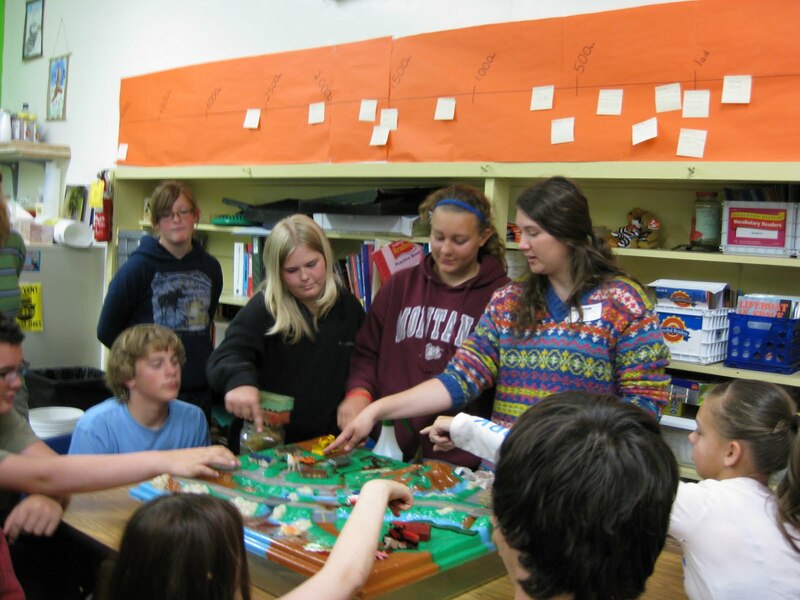 I lead the plastic Enviroscape town station while Kitty lead the groundwater flow model and Hillary took pictures. I was a bit apprehensive because it was almost summer and these kids were antsy. I started by introducing the town and talking about 4 types of pollution represented by the acronym ANTS: air, nutrient, toxic, and sediment pollution. Then I directed their attention to the plastic farm and asked why farms are good. The kids immediately started talking about pollution and I realized they hadn't been paying attention. I asked who knew someone who was a farmer and almost all the kids raised their hands. Then I asked again why farms are good. "Food!" shouted one student. "Yes food is very important and all food comes from farms" Then I asked, "What kind of pollution would you find on the farm?" The kids thought for a minute then one kid raised his hand and suggested smoke from the tractor. "Yes," I said reaching into a Ziploc bag I had hidden behind the Enviroscape. I pulled out a bottle of bubbles and asked, "who wants to show us air pollution?" Ten hands shot up in the air. I chose a student and watched as bubbles floated and landed all over the town. The students went on to talk about the benefits of suburbs, logging, factories and trucks. Then they guessed almost every type of pollution. They poured chocolate syrup on the road to represent someone pouring out oil, sprinkled chocolate chip dog poo, spread hot coco powder sediment and Kool-aid powder pesticides. Then I gave two students squirt bottles and the Enviroscape town had a rain storm. Exclamations of disgust rose from the students as dark, murky water flowed down the streams and into the lake. Then I discussed ways people and governments avoid these kinds of pollution through berms, fencing off cattle and other preventative measures. When it came time to circle up Kitty asked what the students remembered from the field trip I was a bit nervous. They were obviously distracted by the proximity of summer break and I questioned how much they had learned. 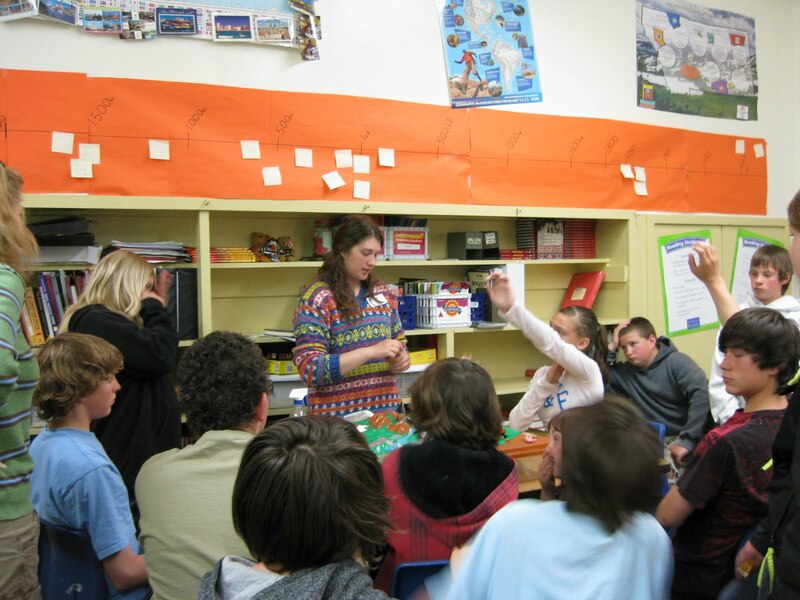 To my surprise many hands shot up in the air and they began talking about key points about aquifers, groundwater, and the Enviroscape lesson. They remembered that they should recycle oil and not pour it down a drain, and that you shouldn't let your dog poop in the river. I smiled. To hear those kids talk about what they'd learned I knew our lessons were not something they would soon forget. I sipped my last bit of coffee and felt energized, not from the coffee, but from the knowledge that we had made a difference in these students' lives.